Miguel’s work wins Forward Thinking poster competition at Marquette. Congratulations Miguel, We thank the judges, Marquette University and the authors. We look forward to presenting more of Miguel’s research in the future. https://www.coviss.org/wp-content/uploads/2017/12/DJI_0045.jpg 1536 2048 Henry Medeiros /wp-content/uploads/2015/01/transparent.gif Henry Medeiros2017-12-22 20:10:162019-01-25 15:20:10Miguel's work wins Forward Thinking poster competition at Marquette. Watch Prof. Seth Hutchinson from the University of Illinois at Urbana-Champaign give a talk on Design, Modeling and Control of a Biologically-Inspired Bat Robot at Marquette University — we apologize for the minor audio problems at the beginning and at the final minutes of the video. Watch Dr. Jeremy Marvel from the National Institute of Standards and Technologies give a talk on Collaborative Robotics: Tools and Metrology at Marquette University. 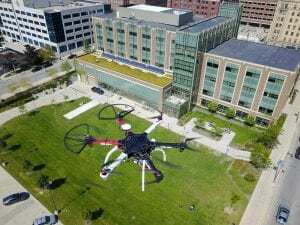 The Milwaukee BizTimes published a story about the robotic vision research being carried out in the lab. Check out the story here. Watch Prof. Richard Radke from RPI give a talk on Human-Scale Occupant-Aware Environments at Marquette University. Dan Schlifske will present a poster on his work A Fast GPU-Based Approach to Branchless Distance-Driven Projection and Back-Projection in Cone Beam CT at the SPIE Medical Imaging Conference in San Franscisco. Dan Schlifske successfully defended his thesis. Congratulations Dan!